Ok! Recipe post, finally. I’ve been trying to get this up for a while! A TCHO chocolate-dipped ice cream cone last weekend gave me the final push to get these photos processed and up. I recently got a box of some of TCHO’s latest offerings, including their milk chocolate baking discs and Mokaccino chocolate bar. I’ve loved TCHO’s dark chocolates for a long time (Fruity is my favorite) and I’ve been after them to come up with their own milk chocolate. They’ve finally done it with their SeriousMilk line – a 39% bar, a 53% bar, 39% baking discs, and a Mokaccino bar that mixes milk chocolate with Blue Bottle Coffee. Although I’ve developed a crush on dark milk chocolates, I wanted to give the 39% baking discs a whirl, and I chose to put them in the most common of chocolate chip applications – the chocolate chip cookie. 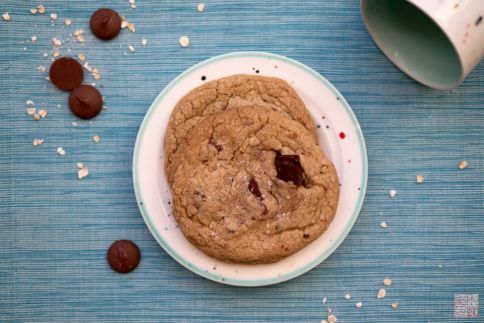 Sure, I have my tried-and-true chocolate chip cookie recipe, but most people have specific expectations for what kind of chocolate goes in their cookie – usually dark, bittersweet chocolate chunks. 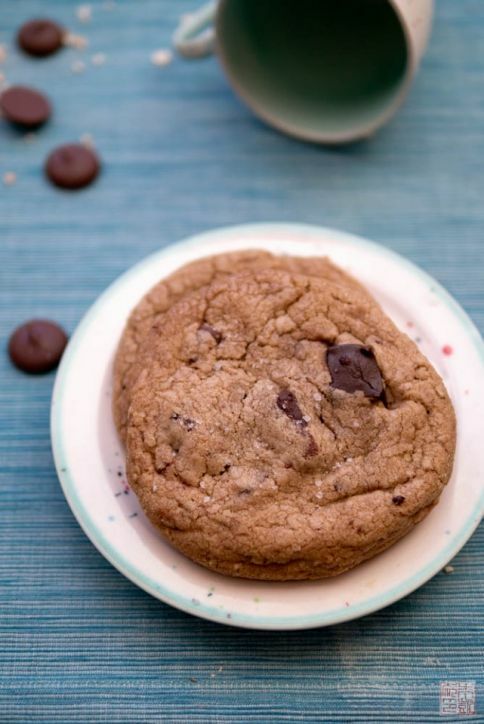 I’ll admit to turning my nose up when I see a milk chocolate chip cookie – so I decided what better use for my bag of TCHO baking discs than to make a milk chocolate chip cookie I’d actually be eager to eat? TCHO’s baking discs are aptly named – they are flat, round disks as opposed to chunks, and they melt beautifully and smoothly. To complement and balance out their vanilla, caramelly notes and to prevent the cookies from being overly sweet, I browned the butter to enhance the butterscotch flavor, and I threw in some ground oats for some heft and texture. I wouldn’t really call these oatmeal cookies – you can probably use regular oats without grinding them up – but I like how they give the cookie a bit more substance. Sometimes you want your cookies delicate and light, and sometimes you want a cookie you can really sink your teeth into. A little sprinkle of sea salt on top also helps cut through the sweetness. Another tip for nice chewy cookies is, of course, to make them on the bigger side. You can probably get more than 14 regular-sized cookies out of this recipe, but I find that generously proportioning them lets the edges bake up pleasantly crisp while the center stays soft and chewy. Glad to add TCHO to my list of places with milk chocolate I’d happily eat more of! Place 4 oz of the butter in a saucepan. Melt over medium heat, swirling occasionally, until it starts to turn brown and smells nutty. Do not let the butter get too dark or it will burn. Strain butter into a clean bowl. Place remaining 4 oz butter, sugar, and brown sugar in bowl of stand mixer. Beat with paddle attachment until light colored and fluffy. Add browned butter and beat to combine. Add in egg and beat to combine. Add in vanilla and beat to combine. Combine flour, ground oats, baking soda, baking powder, and salt in a medium bowl. Add to mixer and beat just until combined. Add in chocolate and mix just to distribute evenly. Place approximately 2 in round balls on prepared sheets. Press down lightly to flatten. Sprinkle tops with sea salt. Thank you!! Hope you like them! These sound lovely! 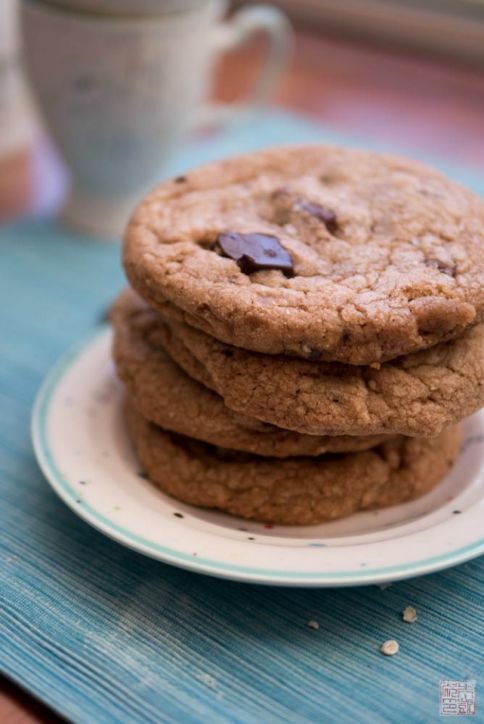 Chocolate chip cookies and browned butter were made for each other! Thanks Katrina! I couldn’t stop eating them! 2nd paragraph in the directions melt over medium heat until? until what? how do you measure a 2 inch size ball of dough. I amended the recipe instructions to say when you should take off the browned butter. As for measuring a 2 inch ball of dough, if you have a ruler you can measure across the widest part of your ball of dough. 2 inches is meant as a rough estimate and you do not have to measure every single ball of dough you roll – you can just eyeball it.